I made up this toile just over a month ago but put it to the side as I had other things that I needed to prioritise. One of the reasons why I haven’t gone back to it in a hurry is because I’m still deciding what to do with it. The main focal point of this dress is the pleated section on the bust which is constructed using a variety of pleats and darts. Here-in lies the difficulty – how do you make a Full Bust Adjustment to this pattern? 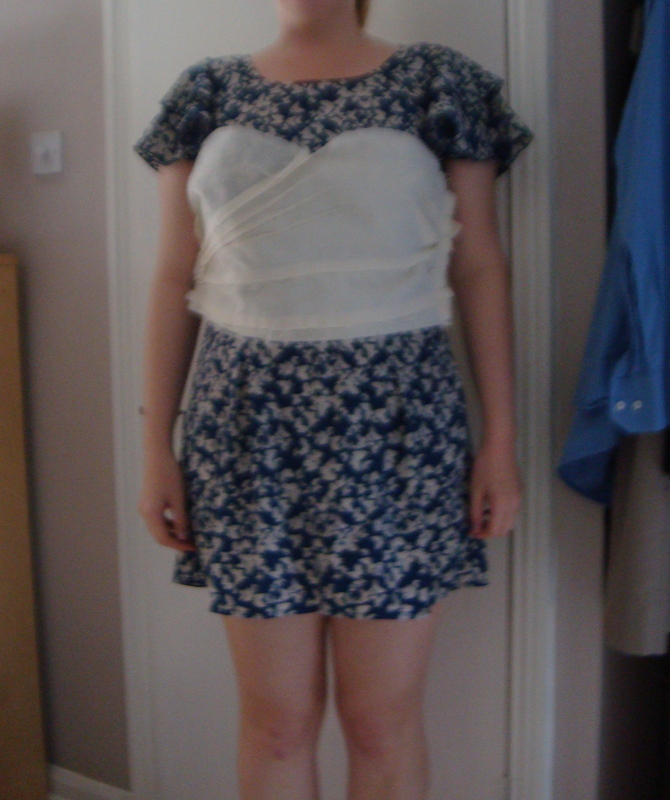 Well my first idea was to make the dress in it’s largest size (a size 22) and then make up the toile and adjust it from there. Mainly taking it in at the sides – however whilst I can take off a couple of inches at the sides, it leaves the front in a bit of a mess. When I try to make the darts and pleats bigger, I get odd baggy bits elsewhere and not a smooth fit. 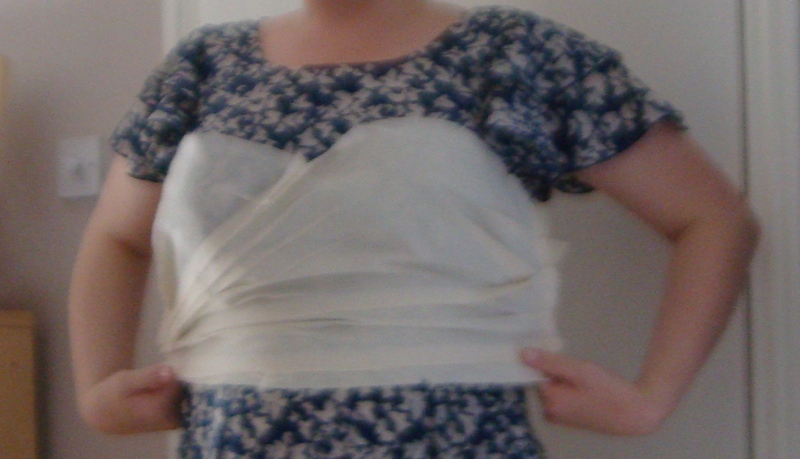 The solution ideally would be if I owned my own dress form in my size that I could manipulate the fabric on. It’s quite difficult doing it to yourself in the mirror to be honest!! Apologies for the terrible pictures, I hadn’t realised how blurry they were! So I’m thinking the next plan of attack is to use my high bust measurement to decide on which size to use – I think this would be the 18. Then take it in at the waist. (I know, I should have done this the first time round!) 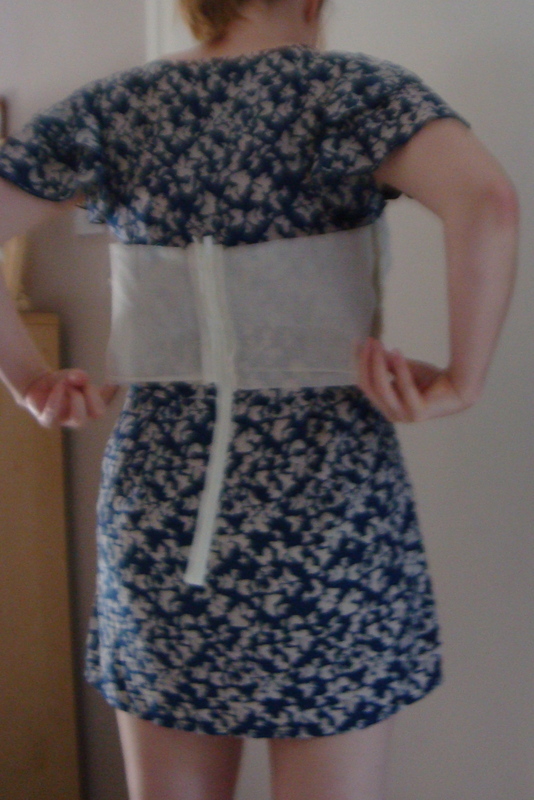 Secondly, go by my waist measurement – the 16 – tack the bust darts/pleats into position, then adjust these to fit my bust. Currently, I’m leaning towards the second option, as I think there is enough fabric in those pleats/gathers to allow for this. But I’m open to all offers of advice!! Hi! I’m working on sewing this Cynthia Rowley for Simplicity dress (pattern 2250). Unfortunately, somehow I misplaced piece 11, and can’t find it at all! Thus, I searched google and stumbled upon your blog and this post! If you still have that pattern, could you tell me the dimensions of piece 11 (it’s for the elastic)? I would be forever grateful! Thank you so much!